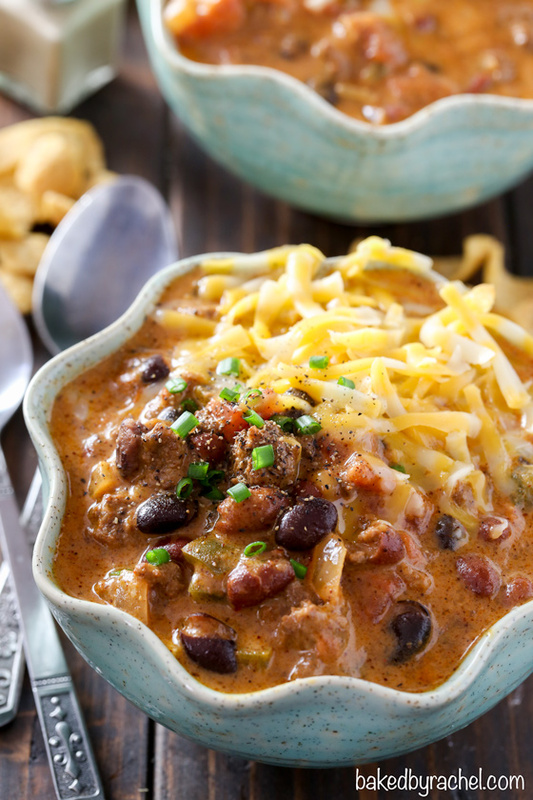 Thick and hearty slow cooker cheesy beef and bean nacho chili! An easy and flavorful meal, perfect for game day or any night of the week! 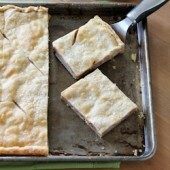 A fun meal to warm up with during cold winter months! It’s a miracle! Our tree is finally down and packed away for another ten months. It only took some bribery to make it happen. I’ll have to remember that next time. An offering of steak and the tree disappears! I think we’re down to one box that has to be put away… maybe two, but we’re definitely getting there! Clearly we’re not in a big rush this year! Very odd! I have heard that we’re not the only ones with stuff out so late this year, which definitely makes me feel better. I was kind of getting used to the twinkle in the room but it’s nice to have things back to normal too! The second miracle of the week… our snow is nearly gone! Of course you know what that means, right? Another storm is probably on the way. If only it were a month or two from now and I could say spring is right around the corner. I know better. But maybe, just maybe, if we eat lots of spring-like goodies, mother nature will decide to come early. That’d be nice! Also… no snow means mud. Bleh. I’d love to get the muddy season over with sooner than later! Is anyone else really surprised that Valentine’s Day is just around the corner? It really crept up on us this year. January FLEW by! So much faster than usual. On the upside… that means that dieting season also flew by, right? Are you ready for all of the chocolate goodies that Valentine’s Day offers? And also, I hear it’s Girl Scout cookie season. Eek! Every dieters downfall, right?! There’s a not so small game coming up that you’ve probably heard about. Only the biggest football game of the year. Yup. That one. And you need food for it. That super big game isn’t really about the game. Nope. It’s about the commercials, the half-time show and even more important… the food! What’s a football party without food?! It doesn’t sound like a party I’d want to be at. Would you? But I’ve got you covered. 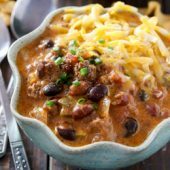 This chili is hands down, the absolute best chili ever and it will please even the pickiest eaters! It tastes just like your favorite nachos. In fact, I love taking a spoonful and eating it on a tortilla chip. Cheesy. Flavorful. Insanely delicious. 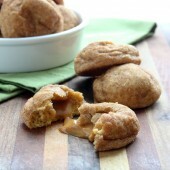 It’s a crowd pleaser and a must make for the big game and all winter long! 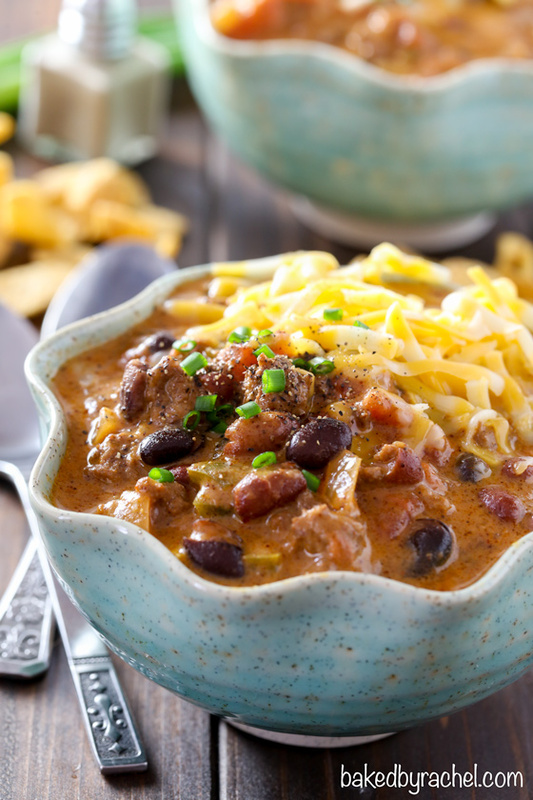 Add this super comforting slow cooker cheesy beef nacho chili to your menu! You’ll be glad you did! 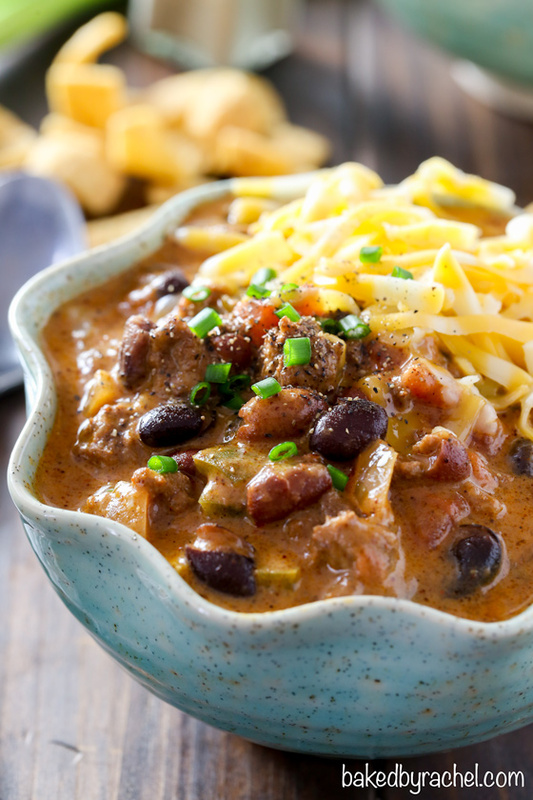 Hearty slow cooker cheesy beef and bean nacho chili! 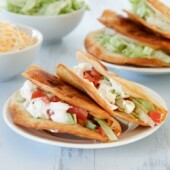 An easy and flavorful meal, perfect for game day or any night of the week! Prepare vegetables and beans as directed. Add vegetables, beans, spices and broth to the bowl of a 5-6 quart slow cooker. Turn on high and begin cooking for 4 hours, or on low for 8 hours. Meanwhile, cook and drain ground beef of fat. Carefully add to the slow cooker. Gently stir and return lid. When the intial cook time is up, whisk together cornstarch and heavy cream. Slowly add to slow cooker. Stir to combine. Freshly grate 8 ounces of cheddar cheese. Add to slow cooker. Stir gently to combine. Return lid and continue to cook for an additional 30 minutes or until desired thickness is reached. Serve warm with additional shredded cheese and green onions. Cheesy. Beef. Nacho. Chili. Ummm.. YES?! Looks incredible. My family is going to go crazy over this stuff! It likely could but I do not have instructions for you.